A 29-year-old man who allegedly opened fire on a Hillcrest restaurant with an assault rifle was being held Wednesday without bail. Stefano Markell Parker was arrested nearly an hour and a half after the non-injury shooting that happened around 7:40 p.m. Tuesday at a restaurant near the intersection of University and Fourth avenues, according to San Diego police. Dispatchers received several calls shortly before 7:40 p.m. Tuesday from people reporting that a man was wearing a trench coat and carrying a rifle near University and Fourth avenue, an area lined with restaurants and bars, San Diego Police Officer John Buttle said. 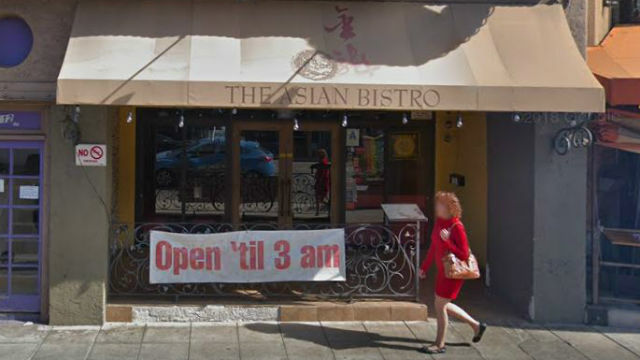 The gunman walked up to The Asian Bistro and started firing into the restaurant, Buttle said. “Several people and employees were inside. However, nobody was hit by gunfire,” he said. The gunman then lowered the rifle and walked away, the officer said. The rounds shattered windows at the eatery and some people inside reported being hit by shattered glass, but any wounds were superficial, Lt. Andra Brown said. Investigators at the shooting scene found at least 19 .556-caliber shell casings, Brown said. Officers began searching the area for the suspect with the help of a police helicopter. A witness told officers he saw a man changing his clothes in the area and the witness was able to provide officers with a new clothing description. Before the suspect was arrested, officer found clothing matching those worn by the suspect discarded in an alley, Brown said. Officers located Parker and arrested him around 9 p.m., Officer Dino Delimitros said. Police also found an AR-15 rifle and magazines for the weapon near the shooting scene, he said. Police have not disclosed a suspected motive for the shooting. Parker was booked into San Diego Central Jail on suspicion of nine counts of attempted murder and one count each of being a felon in possession of a firearm and using a firearm in any felony, according to jail records. He was being held without bail and is expected to be arraigned Friday afternoon.